The Ultimate Redneck Repair Kit does it all, with the WD-40® 3 oz Handy Can and a 6 yard roll of duct tape. Whether it moves and shouldn’t, or won’t move and should, with this kit you’re ready for anything! Custom imprint on white or silver metallic label on can. used under license by Natural Trends. Price includes 1-4 color process on white or silver metallic label. One set-up charge per design: $50 (v). PMS matches are not exact, but are close approximates. 80 units/34 lbs per box. All aerosol product is sent via ground only and in compliance with HAZMAT regulations. 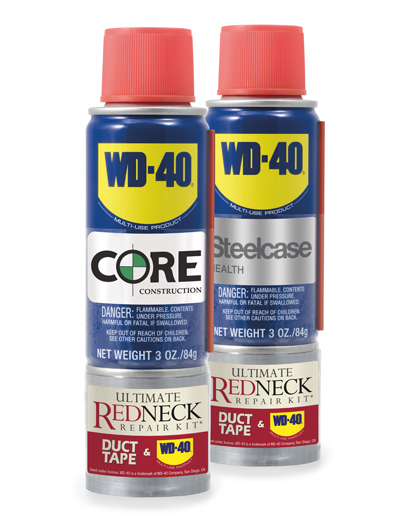 You can use WD-40 to protect, remove gunk, and lubricate thousands upon thousands of items wherever you go! Duct Tape is a cloth-backed pressure sensitive tape used in situations that require a strong, flexible, and sticky tape. KEEP OUT OF REACH OF CHILDREN. Contains petroleum distilates. Inhalation abuse may be harmful or fatal. Avoid eye contact. Use with adequate ventilation. FIRST AID: Eye Contact: Flush thoroughly with water. Skin Contact: Wash with soap and water. IF SWALLOWED: DO NOT induce vomiting. Call a physician or poison control center immediately. 24-Hour Health, Safety & Product Information: 888-324-7596.